Can you believe that?? I had never expected that I would ending up owning a business, much less keep it up this long, but here we are! I can't express how grateful I am to everyone who has purchased from me, swatched for me and otherwise supported this little endeavor. Oh, did I mention I'm about to turn 30 too?? That's even crazier! I was just getting used to thinking of myself as a twenty-something! I'm going to have sales going in the shop every day until Cyber Monday--today you can get 30% off the When in Rome collection, so go check it out! OK, on to the part you've been waiting for...the GIVEAWAY!! 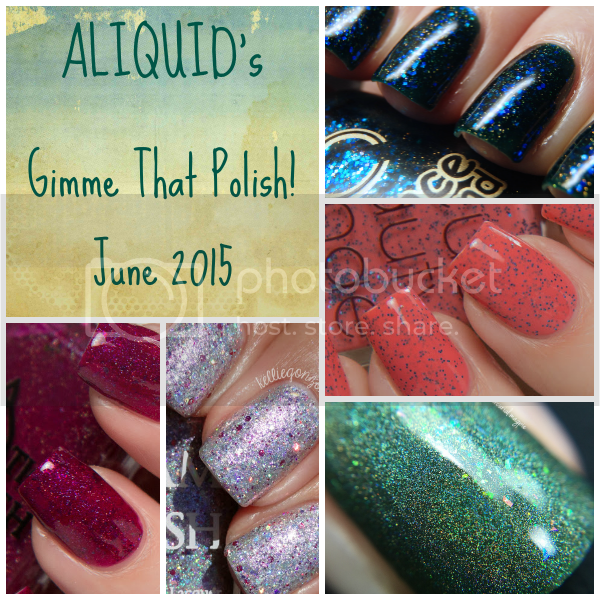 I'm giving away three polishes of the winner's choice. 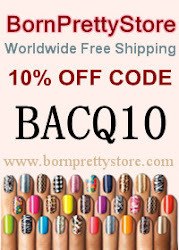 This is open internationally and runs until 11:59 PM on November 30. Cheating entries will be deleted! The winner will have 48 hours to respond to my email. Hi gang! Oh man, I'm such a terrible blogger. I've barely even done my own nails this month. It's been a combination of starting grad school, getting a HUGE response to my fall collection (which was awesome, but having to pour, pack and ship over 60 orders was a little scary! ), and then getting stomach flu last weekend. Fun times! I did do some fun Greece-inspired nail art that's featured today over at Polish Those Nails, so please go take a look! It was so nice for Marisa to ask me! Hi gang! I wanted to quickly show you the polish I wore on my first day of classes last week! 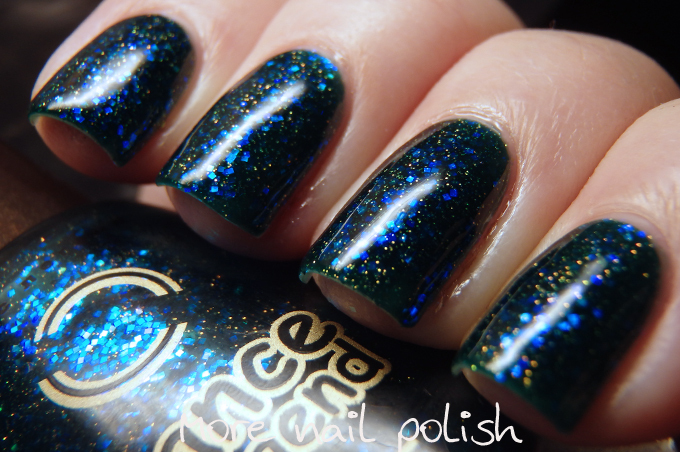 This is Zoya Cecilia, a bright turquoise creme. 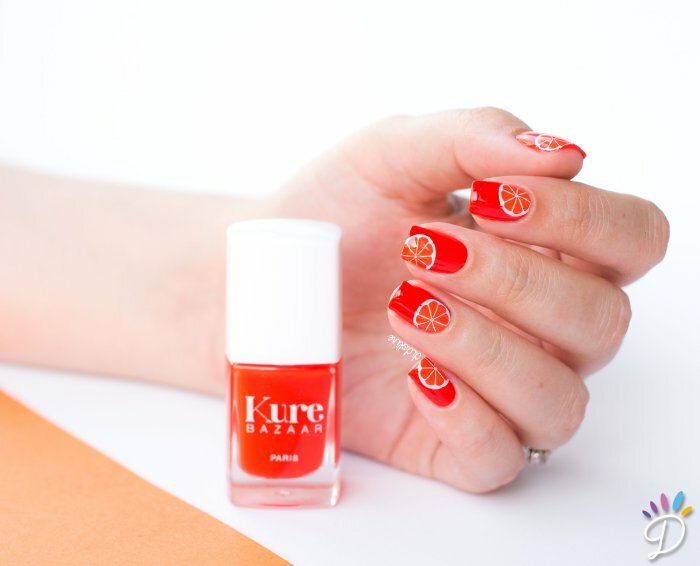 It's from the latest summer collection, but I think it works great for early fall as well! Zoya Cecilia. Two coats with Out the Door topcoat. The formula was unfortunately a bit thick and sticky. (That might have been partly due to the high temperature/humidity in my office.) So make sure not to overload your brush. On the bright side, it was nearly a one-coater. I'm going to try to do some nail art for class this week. Gotta make a good impression! Hi folks! Today was my first day of classes...very weird to be back in a classroom again, especially as the topics are completely new to me! 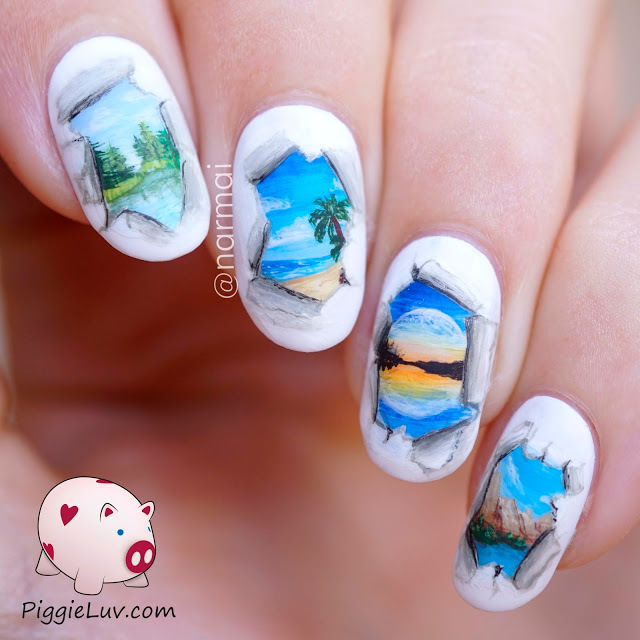 I finally have my favorite nail art from August to share with you. 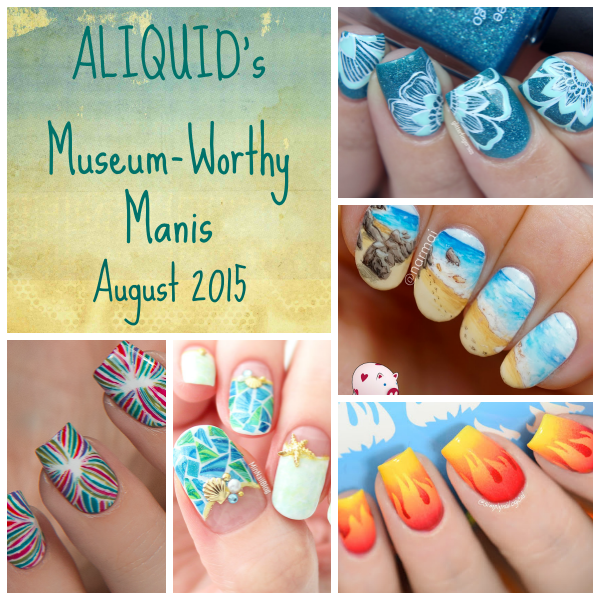 Lots of summery manis this month! Please make sure to visit the original artists' posts and leave a nice comment! 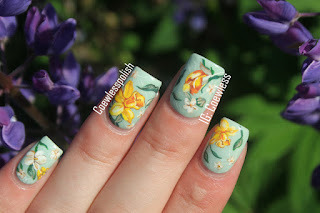 Yep, those flowers are freehanded! 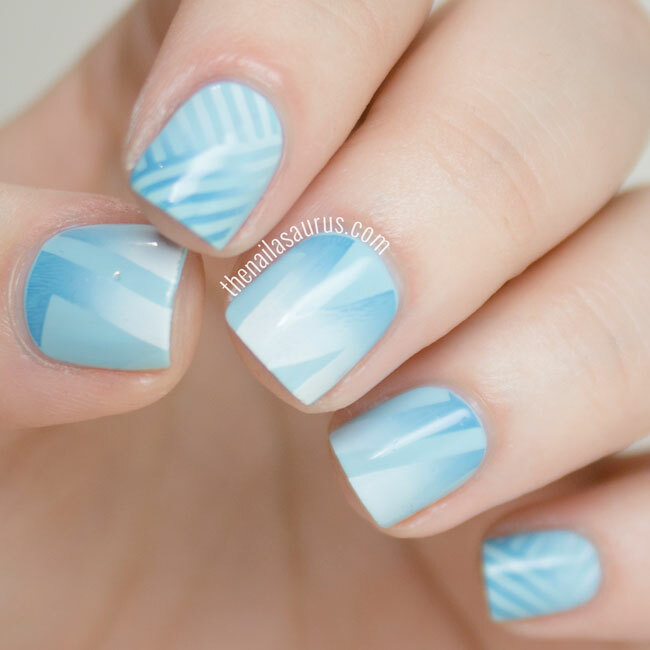 I'm drooling over these nails. I love florals in unexpected colors--these have a very mermaid-y vibe to me. 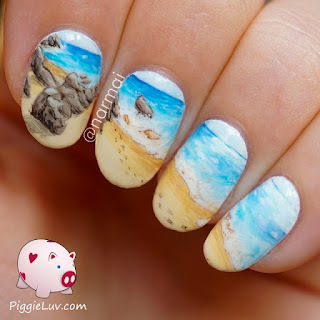 Don't you want to be on that beach right now? Impeccable landscape as usual, right down to the tiny footprints! Actually, I think a more accurate title for this mani would be "fire literally on nails", but I digress! 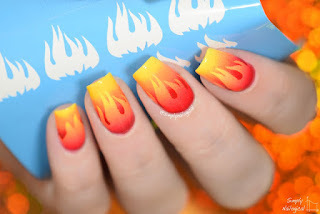 Simply Nailogical always has something interesting going on with gradients. I can't stop staring at this one! This mani reminds me of a really fancy swimming pool! This is one of those techniques that's relatively straightforward but turns out stunning (which means I have to try it at some point!). 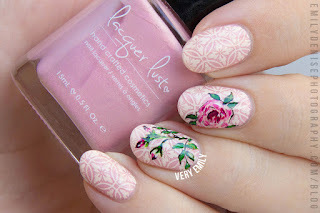 These are some absolutely immaculate stamping decals! 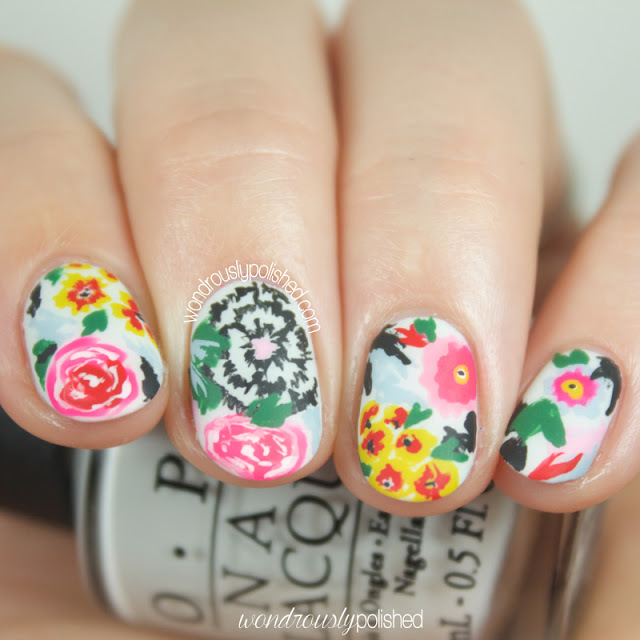 Love the abstract floral pattern. This mani also makes me appreciate how well the Zoya Island Fun collection goes together! Happy September everyone! 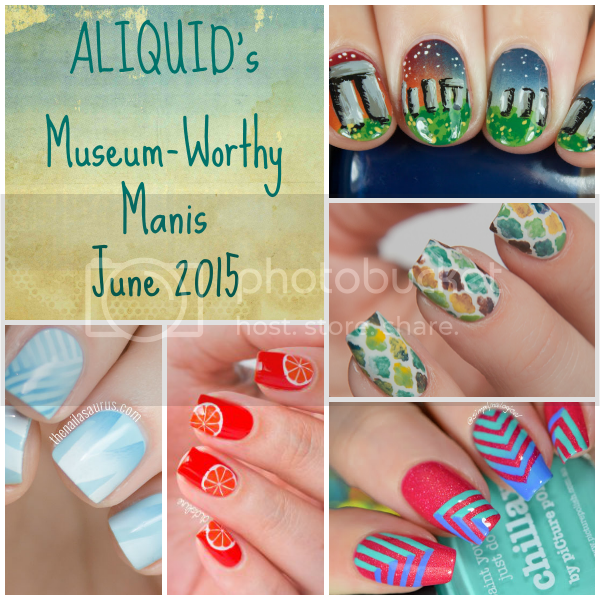 Of course I have to start the month with my top five lemmings from last month! This time I have some "weird" colors on the list--they always seem to come out more in the fall, which is fine by me! 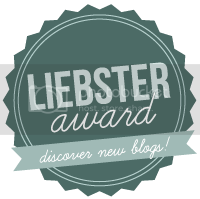 Make sure to visit the original bloggers' posts for more info. Happy Monday everyone! It's the last day of August, but summer is definitely hanging on here--it's over 90 degrees today. Yuck! 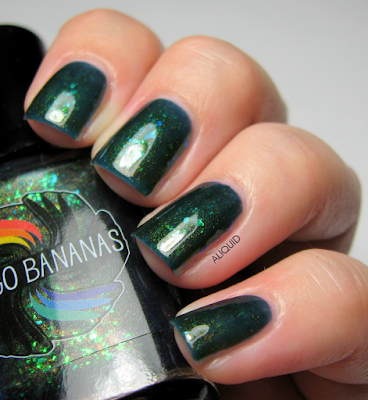 Today I have a swatch from one of my favorite indie brands, Indigo Bananas. 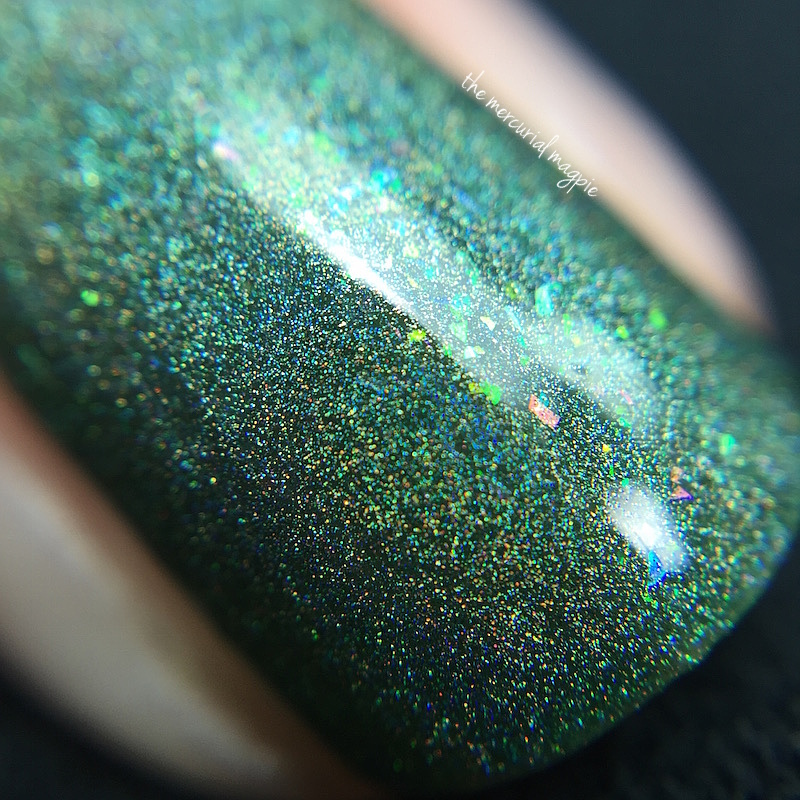 Last year she released a bunch of polishes with beautiful color-shifting flakies, and this was my top lemming from the collection. 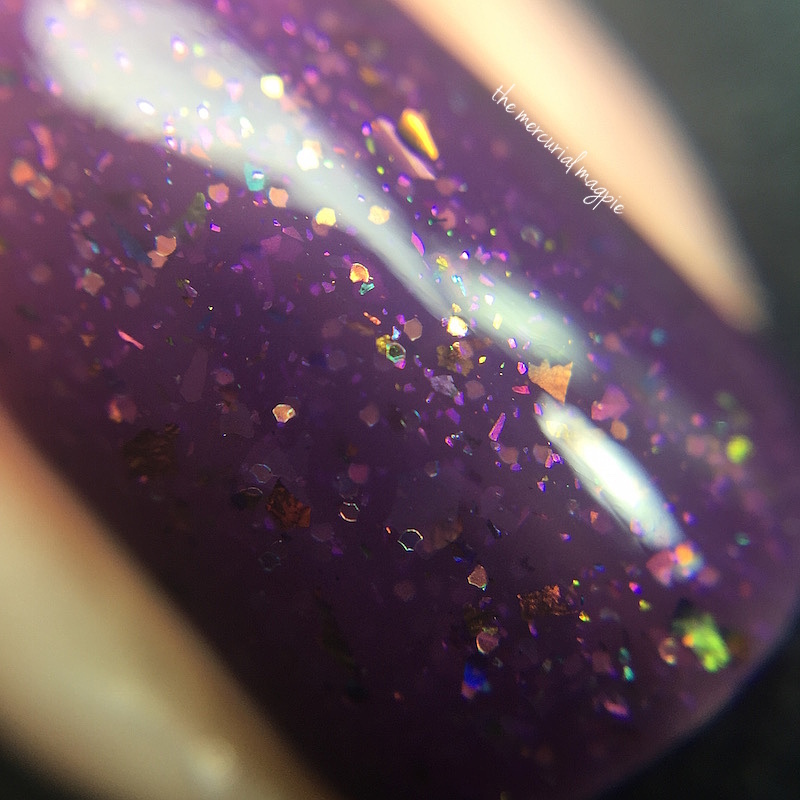 Acid Ocean is a dark teal jelly with green-blue-purple shifting flakies, plus what looks like some Fantasy Fire-type shimmer! So squishy and ethereal! Indigo Bananas Acid Ocean. Three coats with Out the Door topcoat. The formula was on the runny side for a jelly, so I needed three coats to build up the color. Otherwise I had no problems with it! 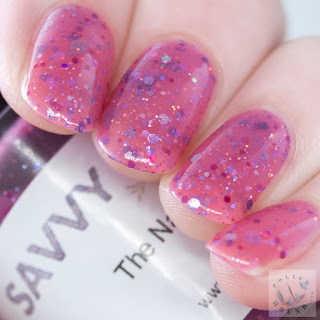 The flakies are the classic type that lie perfectly flat. 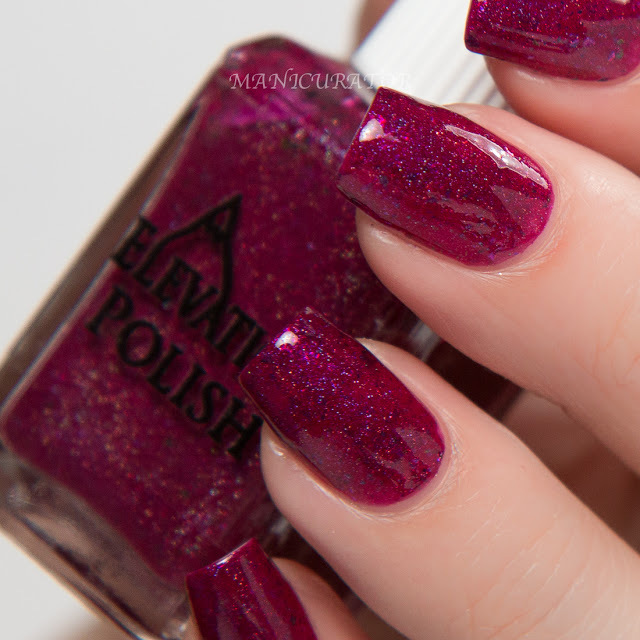 Yet another gorgeous IB polish! It's available here for $12 for 15 ml, or $7.25 for 8 ml! Hi kids! 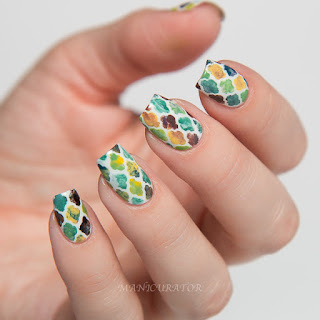 Today I tried out a new nail art technique that I just discovered--it gives your mani a watercolor look using a stamper! 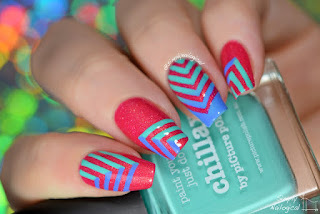 I saw the tutorial at Chit Chat Nails, so go check out her post for the details! I started with a white base and added the watercolor with ILNP A Twist of Lemon, ILNP Sniffany, Essie Vibrant Vibes, Essie First Timer and Essie Chillato. I did three applications on each nail for more depth. It's a very peaceful blend of colors! Afterwards I decided to do a subtle accent nail by stamping on a flower design from MoYou Pro 08 using Bundle Monster Angelic White. I'm getting a lot of zen from this mani! Hey gang! Happy Sunday! This weekend was sales-tax-free weekend here in MA, so we celebrated by walking around a mall near our new place that we'd never been to before. I ended up getting some new clothes for school. I had never heard of tax-free weekends before I moved to the East Coast, but I think it's a nice idea! So this past week we got a free trial of Blue Apron from my parents, who have been using the service for a while. Never heard of Blue Apron? Well, if you cook just for one or two people, you've probably come across this problem before: you find a new recipe you want to try, but it requires some obscure ingredient that you can only buy in large amounts, so you end up with way too much, and it eventually goes bad and you have to throw it out. Blue Apron gets around that problem by sending you three recipes per week, along with the exact quantity of ingredients that you'll need. And it sends you ALL the ingredients; you only have to supply cooking oil, salt and pepper. They even sent me a pat of butter for one recipe! You can choose between a two-person and a family plan, and let them know your dietary restrictions. The ingredients come in a refrigerated box via express shipping, so everything was in good shape, including the meat. The produce was all beautiful and perfectly ripe, and it looks like they try to get their products from small, local farms. 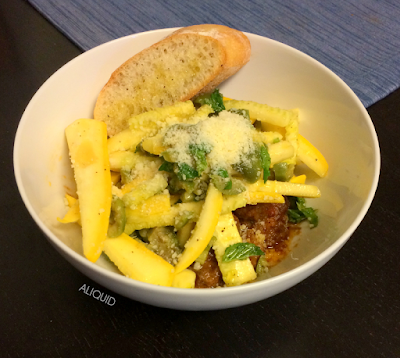 Our first night I made North-African style beef meatballs with a squash salad and garlic toast. The meatballs were strongly seasoned and tasty, and made a good contrast with the raw squash, but the inclusion of lemon and mint in both components linked them together nicely. We found the meatballs to be a little too salty, but that was probably my fault, since I was adding seasoning along the way. Day two was a Thai-style ginger and basil stir-fry with chicken thighs, eggplant and peppers, on top of coconut rice. This was deeeeelicious, sweet and gingery and not too spicy for me. But the star was that coconut rice...I could eat a pound of that stuff. On day three we had ratatouille over parmesan polenta with cheesy garlic toast. 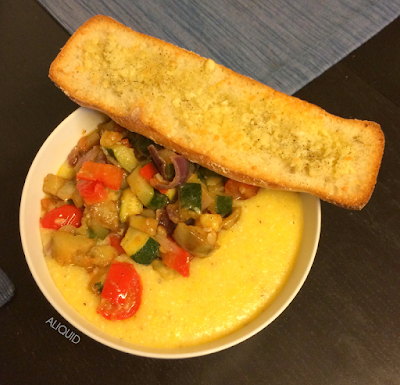 The ratatouille had eggplant, tomato, bell pepper, zucchini and onion and was amazingly simple yet tasty. And polenta is another thing I could eat all day every day. I actually got quite a bit of leftovers from this one! 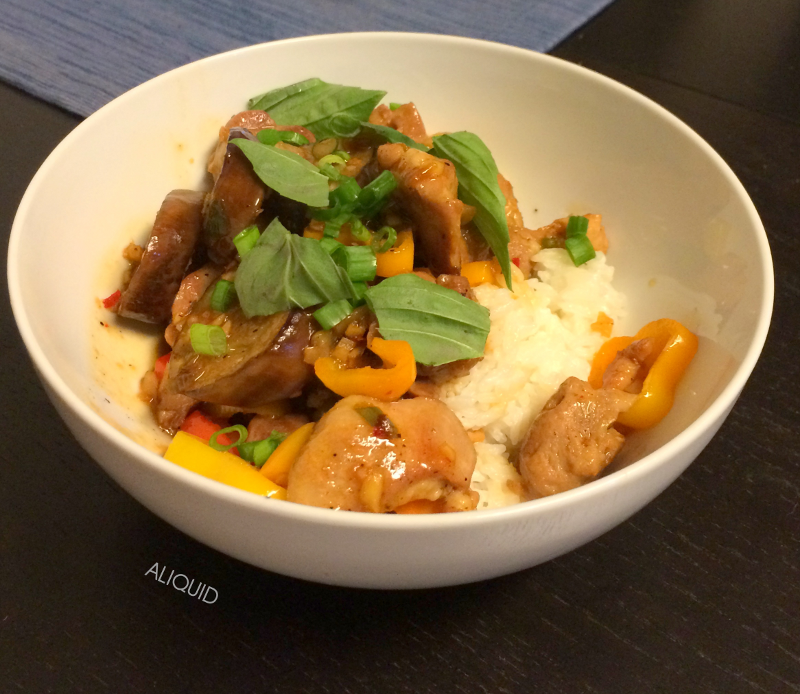 As far as the cooking goes, the recipes were all very easy; I think the hardest thing I had to do was make rice. Basically, if you know how to saute, you will do fine. Nothing took more than an hour to make. The major downside to Blue Apron is the price: $60 per week for the two-person plan, or $10 per serving. (Note: you can pick and choose which weeks you receive recipes, so it's not every single week unless you want.) While I think that price point is totally reasonable for what you get, it's a bit beyond our budget at this point. But I'll definitely be keeping Blue Apron on our radar for later on--I think it's a great way to try a variety of food without wasting any produce! What do you think--would you try this service? 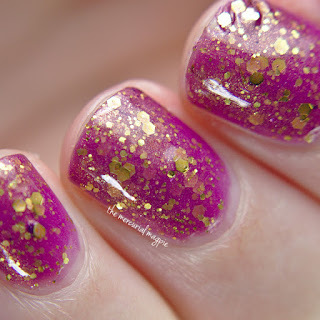 Anyway, today I'm showing you a polish I got in a swap recently! This is F.U.N Lacquer Reunion (H) (my first from this brand! ), which came out around New Year's. It has a multichrome base that shifts blue-purple-red-orange, as well as LOTS of gold holo microglitter, so it's incredibly sparkly! 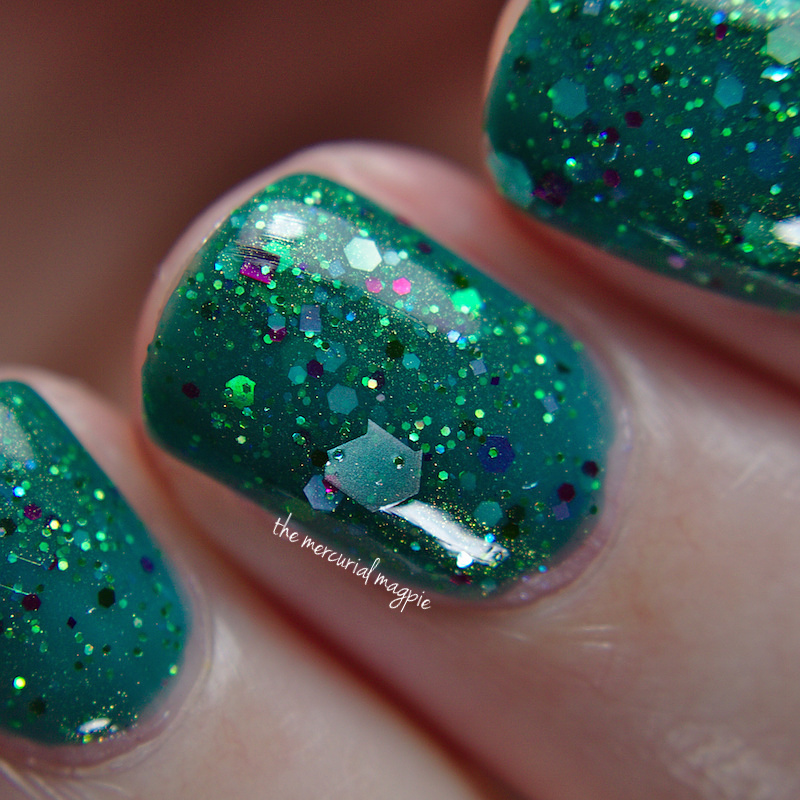 F.U.N Lacquer Reunion (H). Three coats with Out the Door topcoat. I did my best to capture some of the color shift! Look at how strong the holo is, even in artificial light! The formula was pretty much perfect--barely any cleanup required. It was on the sheer side, so I used three coats to make sure the color showed up well. This polish is so eye-catching and definitely a great intro to F.U.N Lacquer for me! Reunion (H) is available here at $12.90 for 12 ml. Happy Monday gang! We got our AC installed today, just in time (it's gonna be 90 degrees tomorrow)! 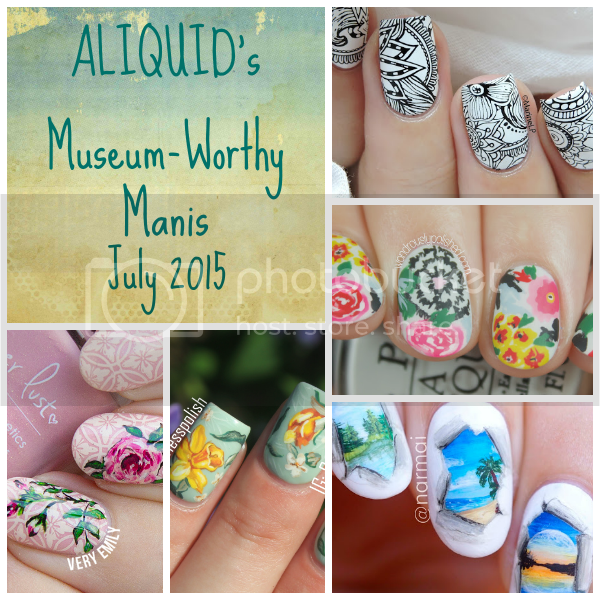 Here are my favorite manis from last month--I was really into florals again! Make sure to go visit the original artists' posts! 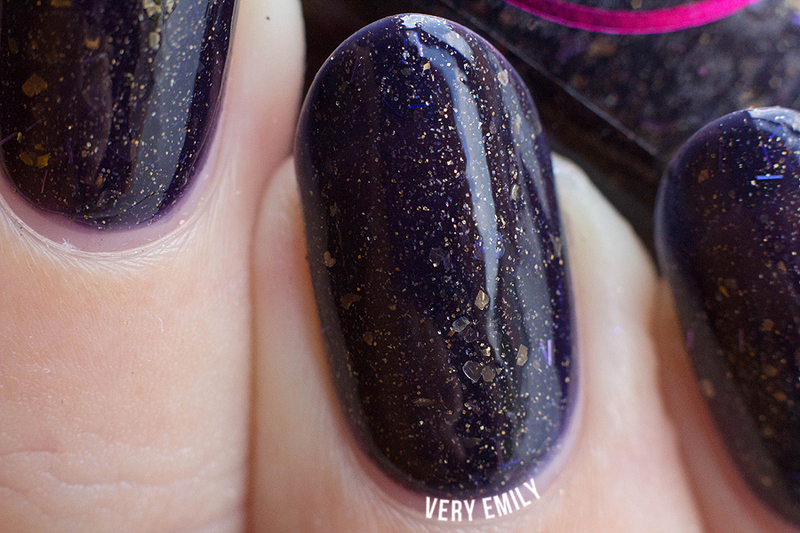 Sometimes you just have to appreciate a perfect stamping job, and this is one of those times. The stark color contrast really makes the pattern stand out! Once again Lindsey knocked it out of the park with her florals! I love the somewhat abstracted style and the inclusion of the black flowers alongside the colorful ones--it's just a lot of fun to look at. 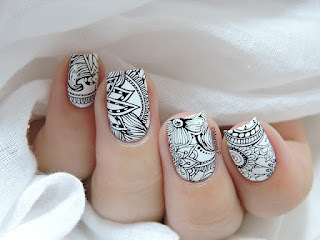 Another amazing freehand job by Narmai--she's SO good at lighting and shadows. The moon over the lake is my favorite nail! This floral art is so different from the one above, yet I love both! This one reminds me of vintage wallpaper. The flowers are so delicate and nicely detailed. Here's yet another gorgeous floral. This one would look great on a china set! So girly and romantic! I'M BAAAAACK!! Did you miss me?? We have finally gotten (more or less) unpacked in our new apartment, I have some fancy new shelving for my office, and I'm just about ready to start doing nail stuff again! I haven't been able to paint my nails much because it's been very hot here, and when I have the ceiling fan running it messes up my topcoat. But we're getting an AC unit installed sometime soon! 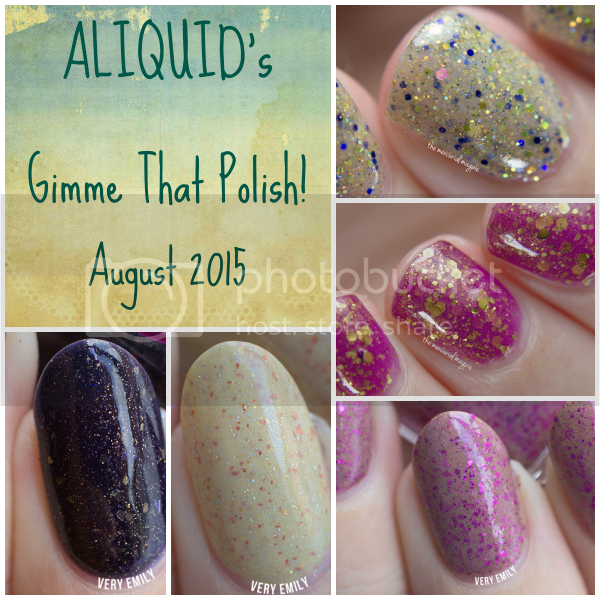 I've got lots of new polish and stamping plates that I can't wait to use! 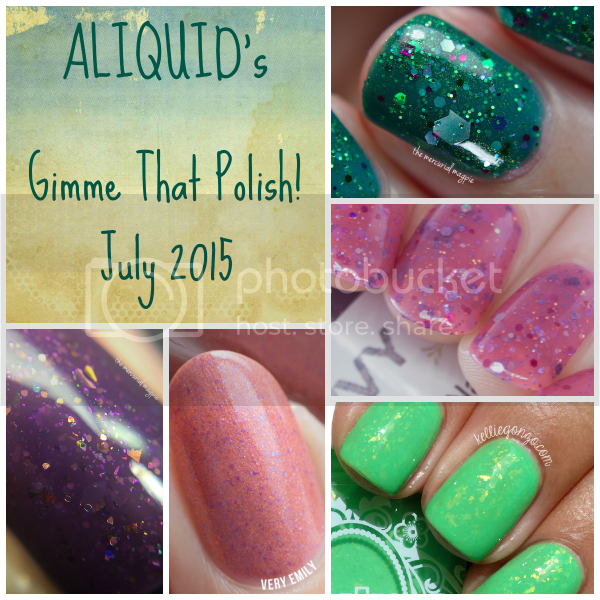 In the meantime, I of course have my top lemmings from last month to show you! 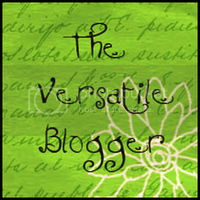 You can visit the original bloggers' reviews for more info! Happy weekend all! Like I mentioned last time, we're in the process of moving to a new apartment. We're in the final phase now, so all my nail polish is at the new place (no broken bottles!). I did my nails one last time to keep my spirits up through this ordeal. This is Girly Bits Going Bananas, which is a really fun shade even though yellow is not my color! Girly Bits Going Bananas. Two coats with Out the Door topcoat. This will be my last post before we get settled into our new place, so I'll see you on the other side! Happy Independence Day to my fellow Americans! I hope you get to relax and enjoy some fireworks, BBQ, or whatever floats your boat! We went into Boston for a few hours to walk around and get some burgers. I did a quick mani to celebrate the occasion. 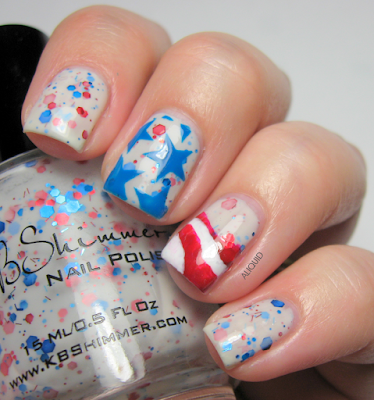 I started with a base of KBShimmer Pimp My Pride, added stars to my middle finger with China Glaze Hanging in the Balance and a vinyl from the For the Love of Polish Box, and painted some flag stripes on my ring finger with Nailtini Bloody Mary and Sinful Colors Snow Me White. Simple! Anyway, here's my favorite nail art from last month. Please go check out the original posts to give props to the artists! 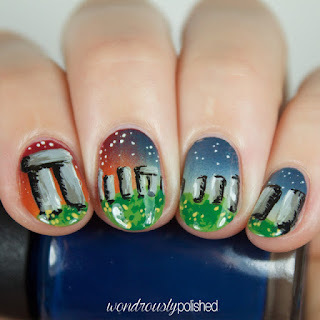 Wondrously Polished is one of my favorite freehand artists, and this is a great example of why! This is a very romantic and mysterious scene to me, and also makes me think of stargazing on a summer evening! Oof, LOVE this one! I think it's the contrast between the crisp, even print and the soft watercolor-style coloring. The color scheme is terrific too! 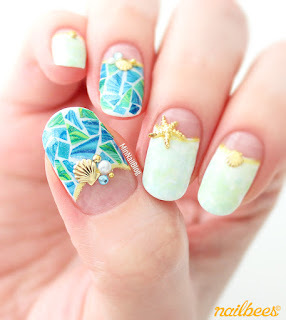 This is a simple mani, but it just epitomizes summer to me. Wanna eat those oranges! Oh lordy...so subtle, yet crisp! It looks to me like the logo for some futuristic airline. Just me?? Hey gang! It's a new month already (how??) so of course I have my top lemmings from last month to show you! As usual, I've linked to the original reviews so you can read more about them. Heya gang! Yesterday was my and Mr. ALIQUID's second anniversary--it definitely doesn't feel like two years already! We celebrated with some big steaks at a nice restaurant (OK, I ate about a third of my steak and took the rest home). And of course I wanted to do a nice mani for the occasion! The other day I watched this tutorial about how to make stamping "decals" without actually having to let them dry and peel them up. This kind of blew my mind (I'm probably the last person to discover this technique, right?). So I decided to try it out, and it actually works! Stamping decals without bubbles and wrinkles, hooray!! 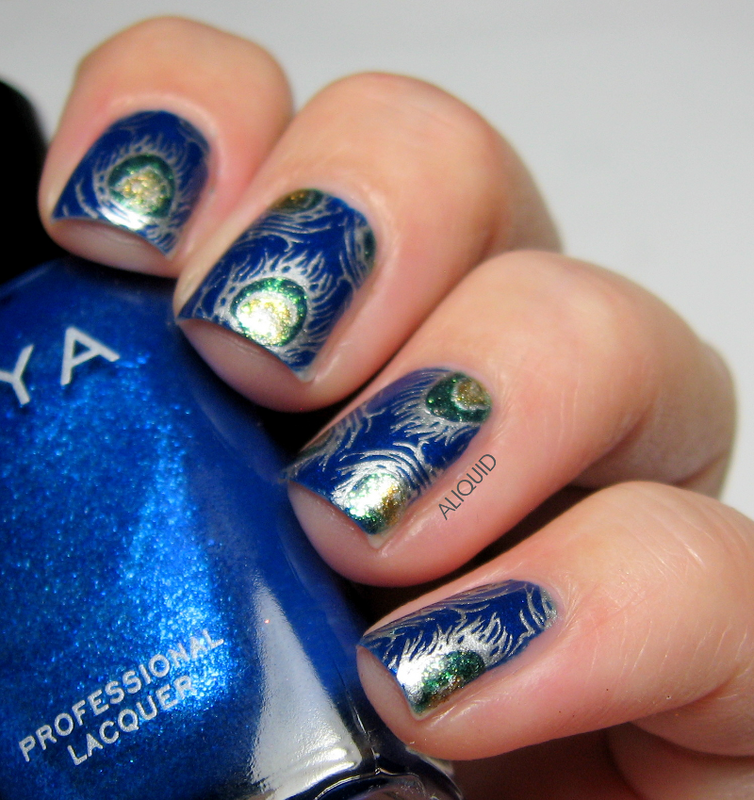 I started with a base of Zoya Song and added a coat of Out the Door. 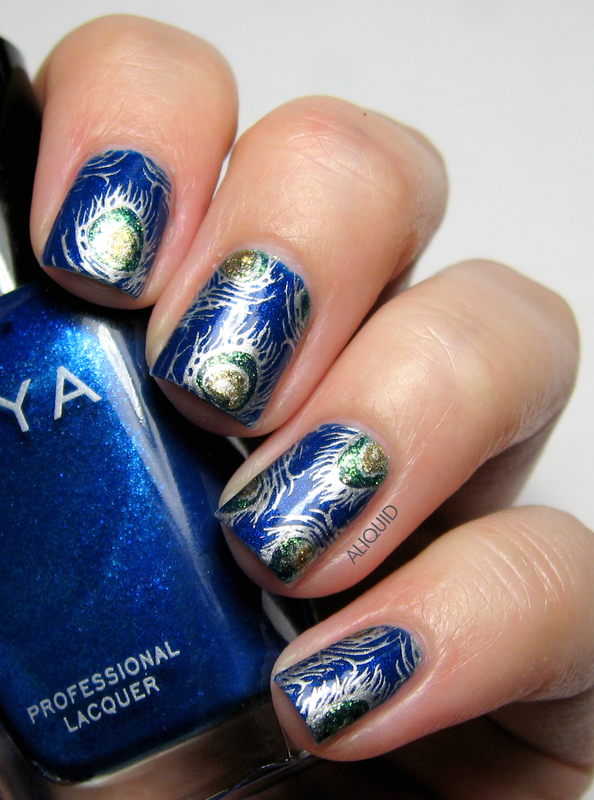 While that was drying, I used the peacock feather stamp from MoYou Pro 03 with Julep Harley and colored in the spots with Zoya Ziv and Ivanka. I let the stamp dry on the stamper for a minute or so, then stamped it directly onto the nail. 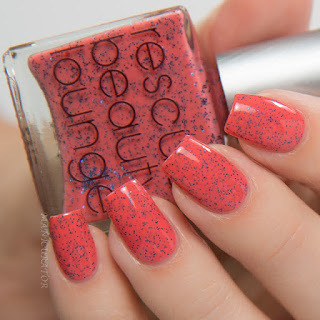 I guess the topcoat grabs the stamp even after it's mostly dry!